One Fat Frog Restaurant Equipment has got tons and tons of used restaurant equipment for your restaurant, bar, pizzeria, deli, food truck, vegan restaurant, etc. One Fat Frog Restaurant has several used tabletop charbroilers at ridiculously low prices. Charbroilers are perfect for steaks, a variety of seafood, shellfish, hamburgers, potatoes, and so much more. A basic gas charbroilers transfers heat via metal radiants made of stainless steel alloy or cast iron. Charbroilers offer a freshpcooked flavor, visual appeal and evocative “backyard barbeque” aromas. The primary function of a charbroiler is to cook a wide variety of foods at high production levels with as short a recovery time as possible. One Fat Frog Restaurant Equipment welcomes quick cash and package deals towards the entire stock of used commercial restaurant equipment – including used charbroilers. One Fat Frog Restaurant Equipment has several used charbroilers for sale including a 60″ one and a 36″ one. 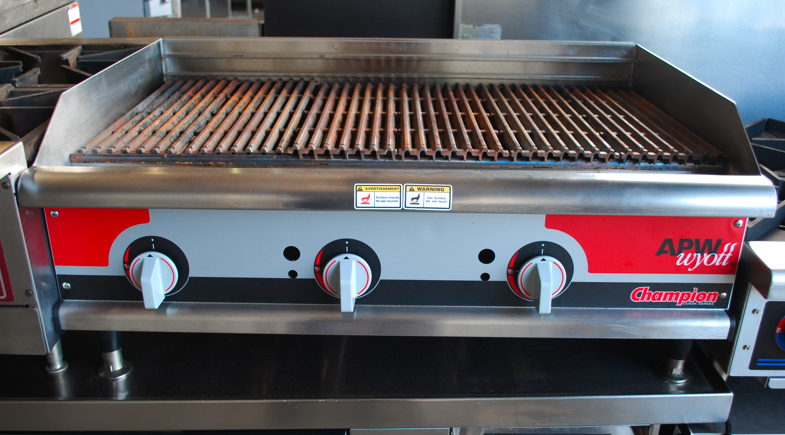 Brands of charbroiler carried by One Fat Frog Restaurant Equipment include Vulcan and Wolf. One Fat Frog Restaurant Equipment can also get you financed for all of the used commercial restaurant equipment you need – including used tabletop charboilers.